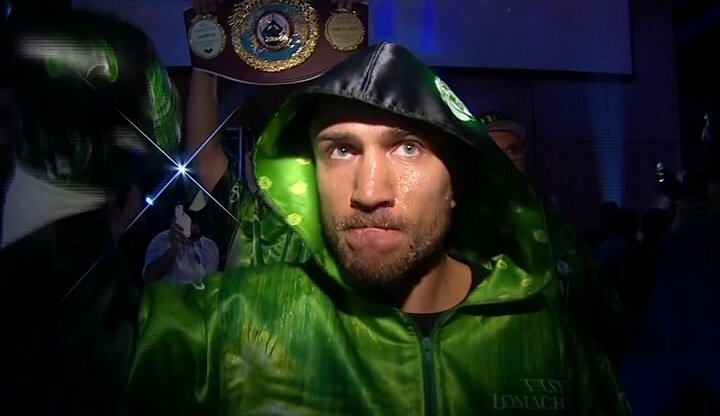 WBO super featherweight world titleholder Vasyl “Hi-Tech” Lomachenko (10-1, 8 KOs) cemented his status as the best pound-for-pound boxer in the world with a sensational 2017, in which he went 3-0 with three knockouts, culminating with a dominating sixth-round technical knockout victory over previously undefeated WBA/WBO/IBO junior featherweight world champion Guillermo Rigondeaux, for his fifth title defense and third of the year. In what was expected to be a fairly evenly matched and competitive bout between two of best pound-for-pound fighters in the world, it was anything but that. Lomachenko demonstrated to the boxing world why he is the most talented, gifted and technically pure fighter in the sport as he thoroughly dominated Rigondeaux. He aggressively backed him up and landed a lot more punches (fifty-five) than Rigondeaux, who is one of the best defensive fighters in the sport, was accustomed to receiving. Rigondeaux was also too busy defending himself and trying to tie up Lomachenko to get anything going offensively. He only landed fifteen shots, which was less than three punches per round. After six one-sided rounds, Rigondeaux claimed he injured his left hand, which was later proven to be untrue, and quit. Rigondeaux lost for the first time since 2003. The two-division world title holder did not lose a round in 2017 as he easily defeated former WBA super featherweight belt holder Jason Sosa in April and former world super featherweight challenger Miguel Marriaga in August. Both fighters quit in the ninth and seventh round, respectively, making all three of Lomachenko’s opponents quit mid-fight, and four in a row, dating back to last year. Lomachenko’s hand speed, power, defense, and boxing skills are some of the best, not only in his division, but in the sport. Undefeated and undisputed WBC/WBO/WBA/IBF super lightweight world champion Terence “Bud” Crawford (32 – 0, 23 KOs) scored two impressive knockout victories this year over Felix Diaz and Julius Indongo for his eighth and ninth world title defense. He won a tenth-round knockout in May over highly regarded contender and former Olympian Felix Diaz, whose only prior loss was a controversial decision to former world champion Lamont Peterson. Three months later in a much anticipated match up with previously undefeated WBA/IBF world title holder Julius Indongo, Crawford scored a devastating third-round knockout, via a brutal left hook to the body. He also knocked him down in the second. With the victory, he became only the third boxer (future Hall-of-Famer Bernard Hopkins and Jermain Taylor, the others) in the four-belt era to hold all the major sanctioning body belts at the same time. Undefeated IBO/WBA/WBC/IBF middleweight title holder Gennady “GGG” Golovkin (37-0-1, 33 KOs) beat arguably the best middleweight contender Daniel Jacobs and sustained a highly-disputed draw to Lineal/Ring middleweight champion Saul “Canelo” Alvarez, in a bout that most boxing fans believed he should have won. Golovkin defeated Jacobs, who came into their fight winning eleven consecutive bouts; among them was a first-round knockout win over former WBO world title holder Peter Quillin, by a twelve-round unanimous decision. He pressed the action and out landed Jacobs, who weighed at least twenty pounds more than Golovkin on the night of the fight. Golovkin also scored a knockdown in the fourth-round. He then settled for a draw against Canelo Alvarez in September, despite the fact that he threw and landed more punches than Canelo, connected on nearly twice as many jabs, and landed more punches than Canelo in ten of the twelve rounds. Nevertheless, Golovkin successfully made his eighteenth and nineteenth consecutive middleweight defense, second only to Hopkins, who made twenty. WBC super flyweight world champion Srisaket Sor Rungvisai (44-4-1, 40 KOs) scored two victories over Roman Gonzalez, who most boxing experts viewed as the best pound-for-pound fighter in the world at the beginning of 2017. He won the first fight in March by a controversial majority decision, with most people watching the bout believed that Gonzalez did more than enough to earn the victory. Sor Rungvisai; however, left absolutely no doubt as to who was the better fighter in September with a brutal fourth-round knockout in the one-sided rematch. He scored two knockdowns in the final round. Sor Rungvisai did what no other boxer came even remotely close to doing in beating future Hall-of-Famer and in the process, put the entire boxing world on notice.